Ronald McDonald House Charities of Alabama is thrilled to share some amazing news from Birmingham! 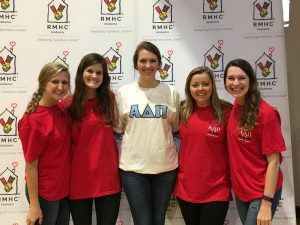 The ladies of Samford University ADPi have gone above and beyond in service to others by raising more than $40,000 for RMHCA. 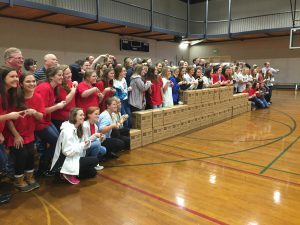 Part of those funds were raised through a special event called Feed the Need. “This event’s goal is to help those in need while also raising money for the charity of your choice,” ADPi Philanthropy Chair Amy Hancock said. So on Saturday, October 28, the chapter members and their fathers teamed up to package more than 15,000 meals for families in need. Five thousands meals fed families in Birmingham and the remaining meals were shipped to Haiti to nourish hungry families. “We are happy to be able to write a check for over $40,000 for the Ronald McDonald House Charities of Alabama, and we know that this money will help keep families close during the holiday season!” Hancock said. 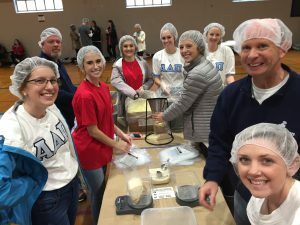 The ADPi sisters raised an additional $30,000 during their fall efforts, which will benefit the Alpha Delta Pi Foundation and the chapter’s scholarship fund. We are truly humbled by the efforts of these women and offer our heartfelt thanks!